Whether you’re a conversion optimization agency, consultant, or in-house at a startup or enterprise, investing in the right conversion optimization tool is a big decision. We’re asked often whether a tool is good, bad, or downright awful, and until now, haven’t put it all together into a cohesive post – until now. To navigate the list, you can filter out tools based on function as well as for which size company it works best. We also gave the option to view only Peep’s favorite tools as well. 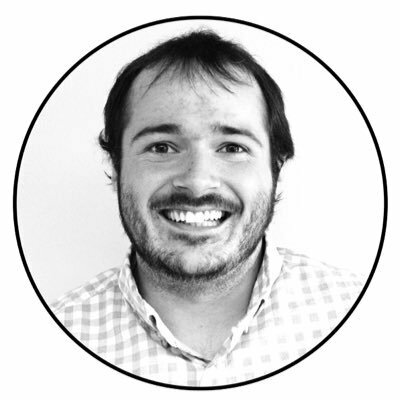 A/B Tasty is another testing tool designed for the masses, this one hailing from France. They offer client-side, bayesian-based A/B testing along with full factorial MVT – the common experiments. “The things I like about ABTasty I like a lot. The dashboard is just a plain list of tests on a white background. Each test has only 2 main options: Edit or Report. There is a separate page for the Editor and a separate page for the Report. Simple and intuitive. The Report is a 1-pager showing all goals one under the other with confidence interval graphs. The report load time is slow but it has some powerful features like ability to use goals as filters. You can, for example, isolate the conversion rate for all visitors who played the video you’re testing. You can fire a goal on mouse movement and use that to exclude bots. It opens the door for detailed analysis. The Editor works smoothly and allows you to interact with each variation. ABTasty has considered some details overlooked by more mature tools. You can add a custom goal right in the code, and it automatically shows up on the report – you don’t need to create the goal first. Each variation on the report has a preview link, and the preview URL is simple. There is even a Planning screen in Beta to track testing ideas. Unfortunately, ABTasty has some major show-stoppers. There are flicker problems even with synchronous code, and the ability to control for flicker is limited. VWO, in contrast, has a solid workaround to temporarily hide specific elements to avoid flicker. ABTasty has no full data export, so you’re limited to what the tools shows. Time charts on reports are rudimentary and disappear once a filter is applied. Support is friendly but slow compared to VWO or Optimizely. It can takes days to hear back and weeks for back-and-forth about an issue. 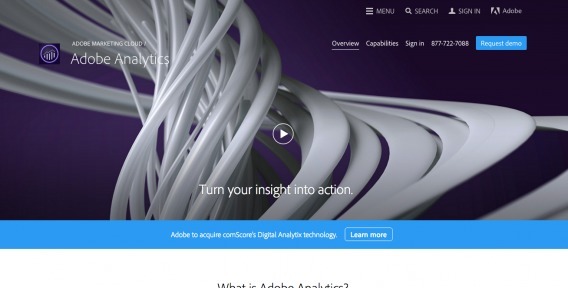 Adobe Analytics is part of Adobe’s Marketing Suite, and it’s a powerful platform. 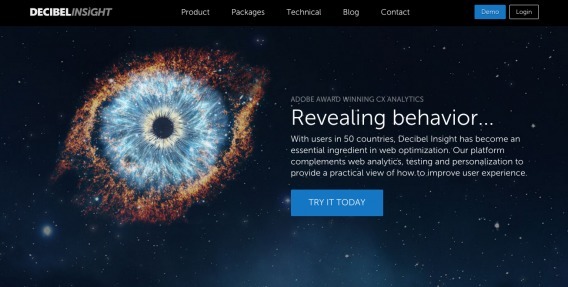 Formerly known as Adobe SiteCatalyst, the tool has pretty much everything you could want, including real-time analytics, mobile app analytics, funnel tracking, and Predictive Intelligence. It’s basically only for enterprises, though. It’s not cheap. Other Adobe products offer capabilities for marketing automation and email, media optimization, audience insights creating and delivering experiences across digital and television,and social. They have a complex ecosystem and veritable one stop shop for many marketing requirements, but not all. Some of their products have significant install bases and can be considered top of class, while other products are not fully integrated or don’t interoperate in obvious ways. Adobe’s recent acquisition of Comscore’s Digital Analytix business adds another product integration to their future roadmap. Great salemanship is to be expected at Adobe. Adobe has even been rumored to give away free product that may not be considered best in class to beat competitors simply by giving it away for free. Free often wins versus buying a competing product. Adobe products can have some complexity to implement but that should be expected given Adobe’s feature set and customizability. 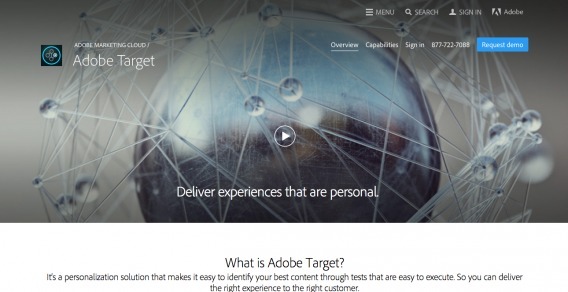 Adobe Target is an enterprise testing tool that does a great job of leveraging a visitor based metric system. They’re one of the most popular enterprise tools out there. Cons – The curse of the tool is that it can do a million things (and that Adobe pushes you constantly to do the least valuable ones). Steep learning curve to do the things that matter most. While they do offer now WYSIWYG editing, it is still at its best with manual HTML overwrite. Ties to Adobe Analytics and other poor product decisions have crippled the once best tool and have made it just an offering for analysts (read: one of the 2 worst groups to do testing). 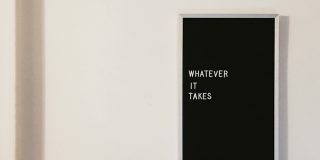 Interface is heavily focused on doing the wrong things. Target Premium offers the second best advanced adaptive learning system to Conductrics but requires a massive amount of data to work ideally. 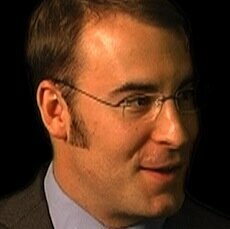 The Adobe Consulting team is now little more meaningless Yes Men who offer little additional value. More than any other tool, it is almost impossible to plug and play and get any sort of real value (though in many ways that is true of all tools). High Cost and barrier for entry means that a lot of people dismiss it without really understanding the true benefits of the tool. Overall – What was once by far the best tool on the market is now almost an afterthought. At each step of the way from Offermatica to Omniture to Target it has progressively lost value, which is pretty hard to do. Even worse, a tool like Touch Clarity which was a decade ahead of its time has been crippled as it moved to Test and Target 1:1 and now Target Premium. Over the last 5 years or so it has lost value at every stage due to poor product management and positioning in the Adobe Marketing Suite. It now requires the most data discipline and the best understanding of causal versus correlative information in order to achieve its true value. The value pieces are still there but they are hidden under a multitude of product sins. At this point all those features in the hands of the average optimizer are a bit like a baby with a handgun, you’re not sure what will happen but in most cases it is all bad. 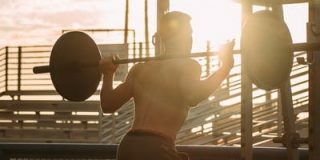 It still can do more and can present more value than just about any other tool, but at this point the barrier to get to that value is not worth the additional cost for the tool. 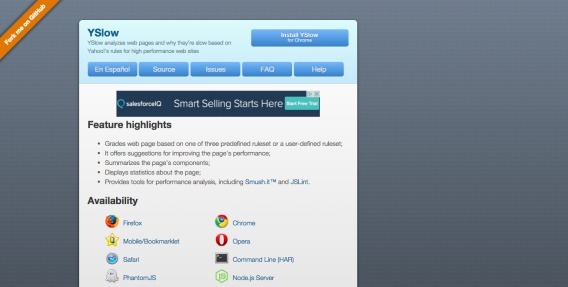 Browserling offers live interaction, web-based browser testing. It gives you a real visual from each browser. From there you can also make annotations and report design errors on any browser. BrowserStack is a live, web-based browser testing tool. “With BrowerStack you fire up different configurations of operating system, display size and browser variation. For cross device testing, you can emulate a range of mobile environments across Android, Windows and iOS. GA’s device and browser reports will guide you in terms of which combinations to use in your QA. 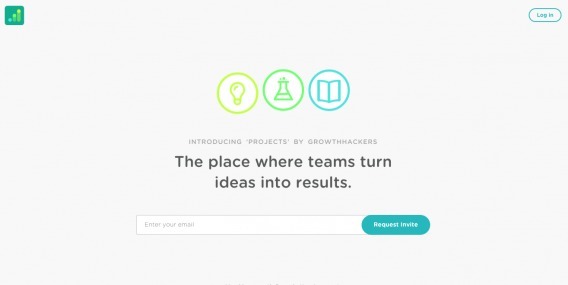 Canvas, by GrowthHackers, helps support the whole growth process (including archiving results). Not only does it archive results, but also ideas, hypotheses, etc. This makes it easier for members of the team to extract insights from past tests, and it also lets new members quickly onboard by analyzing what has and hasn’t been tested in the past. It’s really ideal for startups. It might not help if you’re at a large company (though, maybe I’m wrong, and it would). For us, we run a small team and it’s perfect for organizing and archiving test ideas. One con is that it doesn’t integrate with Google Analytics or Optimizely. That, however, isn’t much a con, because it will have that capability in the coming months. 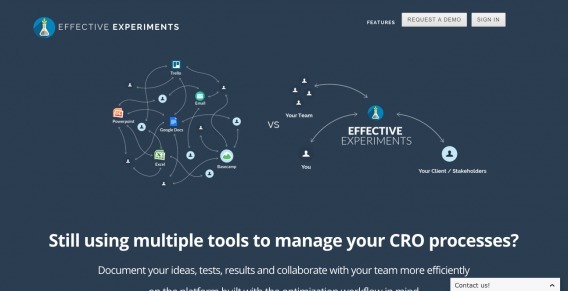 I’m a huge fan and we use it at ConversionXL to manage our growth experiments. 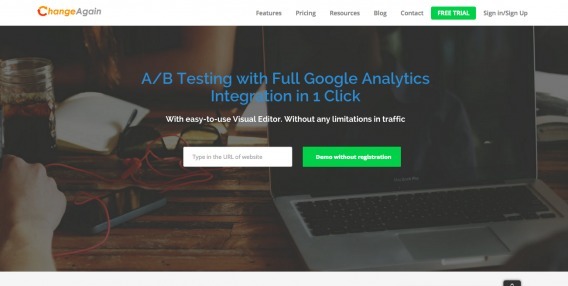 Clicktale is an awesome tool that does session replays, heatmaps, and conversion funnels. “NOTE: My original review of ClickTale contained some inaccuracies about the product. The following review is edited to fix my previous errors. Clicktale measures user behavior very differently than clickstream tools, so there are some questions it cannot answer well. The data model does not lend itself to tracking how many times certain actions happened over time. Merchandising analysis would be difficult, at best, with the tool. You won’t find reports for Revenue per Channel or Return on Ad Spend over time reports like you will in other analytics tools (don’t expect tabular data you can export). Multi-channel analysis and attribution modelling is non-existent in the platform. Clicktale also doesn’t have any cohort or retention analysis reports. No pricing about the product is available on their website, but from what I can gather from speaking with people is that they are focused on the “enterprise” (i.e. $$$$). Clicky is free (if you have less than 3,000 daily page views) and directly positions itself as an alternative to Google Analytics. Clicky has a few features that differentiate (all real time analytics, heat maps), but I don’t think it’s worth switching from GA. If you want heat maps, there are other free tools. 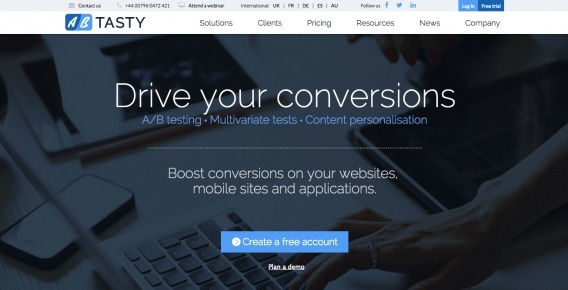 Convert.com is a newer player, and joins the likes of VWO and Optimizely in making an easy an affordable testing tool – though Convert aims more at the enterprise crowd. 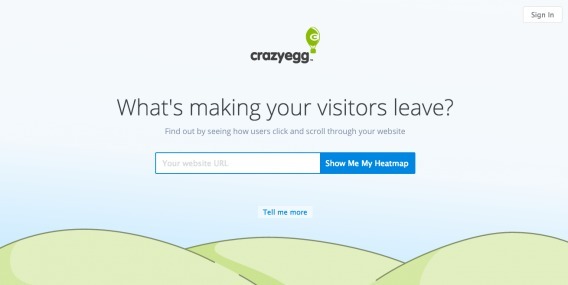 Crazy Egg offers heat maps, click maps, scroll maps, etc to offer you a visual glimpse at how your users are navigating your site. 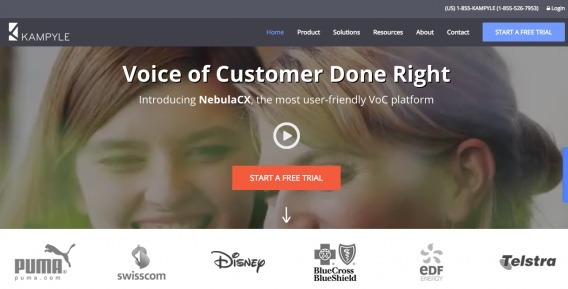 Decibel Insight is a high-powered, enterprise level CX analytics tool. They offer session replay, dynamic heatmaps, form analytics, behavorial alerts, and error reporting. Effective Experiments is a single platform to manage the entire optimization workflow that would help CROs to store their ideas, test plans and results all in one place. They’ve also created some automated features that will save CROs time – such as automated reporting and integrations with A/B testing tools etc. With Ethnio, you can recruit your own testers from website visitors. Very useful for recruiting testers. 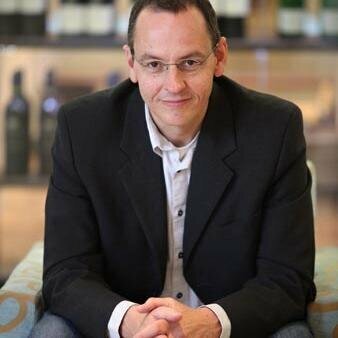 “Watching actual customers interact with your website can generate powerful insights for optimisation. 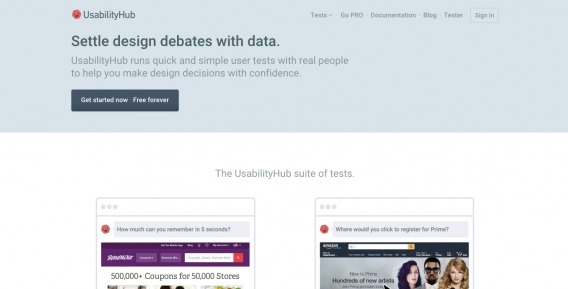 It’s a solution to the notoriously “canned” nature of responses associated with semi-professional panels on popular usability testing platforms. We use Ethnio on every CRO project to recruit real users, real time. An entry pop-up invites visitors to participate in the study. Candidates are then qualified based on their responses to a list of screening questions. Setting up and launching a campaign is quick. 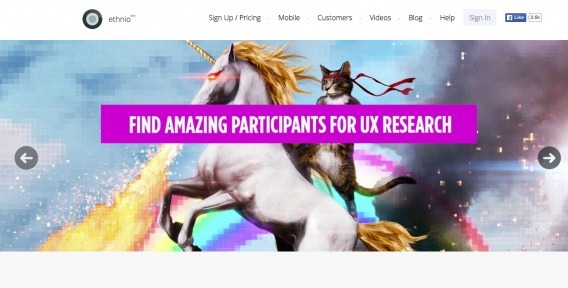 You can auto-pilot the study by integrating with Usertesting.com. Our experience with that hasn’t been great though. Things fall apart when users are asked to install the third party tool, so you end up with abandoned videos. The magic happens when you phone up candidates immediately, and set up screen sharing with a tool like GoToMeeting there and then. You get to virtually peer over the shoulders of a real customer in an authentic scenario. 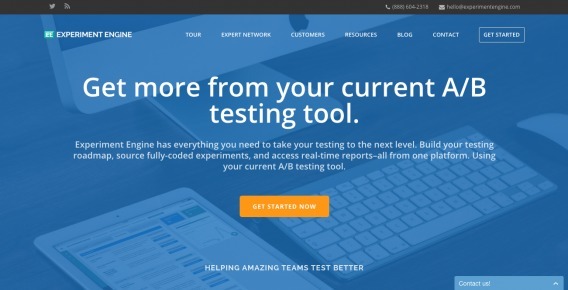 Experiment Engine is a workflow management tools that helps you plan, create, and report on A/B tests. 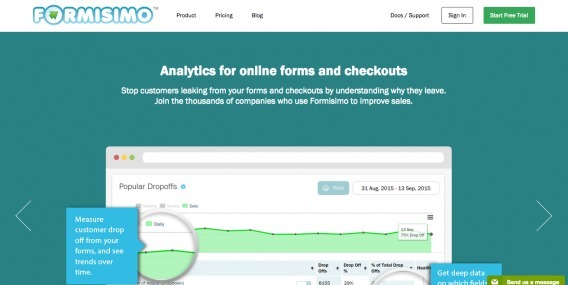 Formisimo is an awesome form analytics tool. 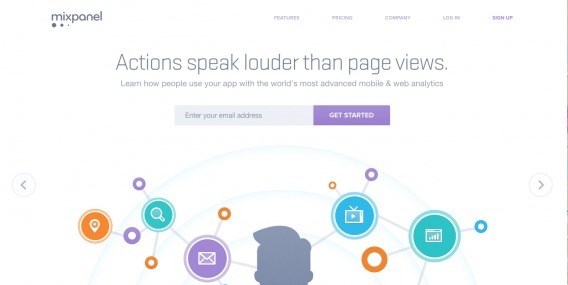 As TNW described them, they are like Google Analytics for forms. Google Analytics is the most common analytics tool used by marketers (73 percent of marketers use Google Analytics). It integrates with almost everything. It’s easy to use. No reason not to have it, really. Install it in less than 10 minutes. Google Analytics can be used to answer a very large range of business questions. The tool has huge adoption, which means that many people know how to use it (at least on a cursory level) and are comfortable with interface. It also means that there are tons of resources available for GA, some free / some paid. Google Analytics is known for it’s excellent UI and great data visualization capability. Some well implemented features include attribution modelling, multi-channel analysis, motion charts, and enhanced ecommerce reporting. The on the fly segmentation capability is terrific. GA’s integration with adwords is very tight. Google Analytics has a very robust team and they keep the entire analytics industry on their toes with continual product updates. The software license for Google Analytics Standard is free. The software license for Google Analytics Standard is free. This means that people don’t invest the requisite time and money into the tool to make sure that it is configured properly for their business. GA out of the box is robust, but it’s not “business ready”; the tool needs proper strategic setup. The Google Analytics data model is fairly rigid; they have somewhat strange concepts such as data scope which makes the tool complex and sometimes difficult to understand. Data is almost never reprocessed, which means if you get some bad data into GA or misconfigured a goal, it is like a bad grass stain on a nice pair of white pants. User segments (which are great!) are limited to a 93 day report window. Cohort analysis in GA is relatively weak compared to other tools. Google Analytics Standard begins sampling data in reports at 500,000 sessions in the date range, which impacts larger sites in particular. Google Content Experiments is Google’s testing and optimization tool, mainly operating with bandit algorithms, but also with the option to run traditional split tests. 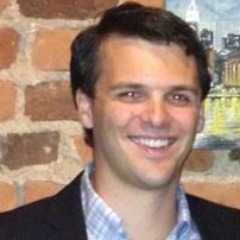 Pros: Bandit algorithms provide a different mathematical model for optimization. With Content Experiments you can’t target a specific segment, but you can analyze the results across segments right in Google Analytics (eliminates need for integration). Big pro is that it’s totally free. 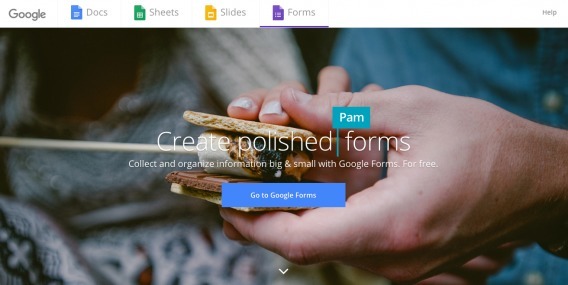 Google Forms is a great survey tool. It’s free. You can get almost anything done with it. There aren’t any bells and whistles, so the surveys look kind of plain. It’s free. While it’s not all encompassing, there’s not reason not to use it. Can find low hanging fruit. Heap Analytics automatically captures every user action in your web or iOS app and lets you measure it all after the fact. HotJar does (almost) everything. In addition to their triggered polls, they also offer funnel tracking, session cams, heat maps, and more. They’re available for a good price too, and actually have a pretty extensive free version. 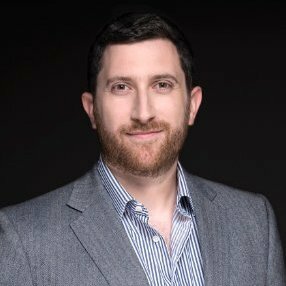 “I’ve been using HotJar since it was in Beta, and I totally love it. The fact that they provide 7 tools in one bundle makes life so much easier for me! 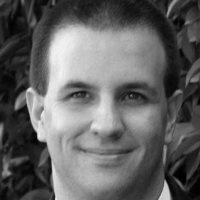 I don’t have to pay for a bunch of different tools, I don’t have to go through a bunch of different accounts, and I don’t have to implement a bunch of different scripts on the website or landing page to get the insight I need (if you are a consultant, you know how much of a hassle this can be). “Mouse tracking videos is probably one of the best features in HotJar. This gives you the ability to see how visitors are going from page to page. This helps you see the user journey from the customer’s perspective. To make this even more useful you can filter the reports by different recording and visitor attributes. For example, you can identify which of the recordings show a visitors that have gone past more than a few pages, that way you don’t have to watch visitors that only visit one or two pages. You can even watch recordings based on a specific user id, device, geo location, operating system and browsers or device. Because this is a new software, there are still many feature requests needed to make this the perfect tool. For instance, currently you can not do tracking across domains. For instance, if your blog is on a subdomain then you can track the flow from your main site to the sub domain. Another great feature is the funnel tracking. It is very easier to understand the data as people go from step to step in the flow of the funnels. This is much easier to understand than the funnel report inside Google Analytics, plus it is much easier to set up. Also a great feature is that you can click to watch videos of all the visitors that reached a certain point in your funnel. This helps add to your hypothesis to understand the insight of why the visitors may be dropping off. Inspectlet is feature rich and affordable, and you can gather and analyze higher volume of clickstream data than other tools in the same price range/category. They do form analytics, session recording, and heat maps. Iridion is a workflow tool pretty exclusively focused on expert optimizers. Built by konversionsKRAFT with the purpose of organizing the entire testing process, Iridion is a sophisticated tool for the entire testing process, from ideation to experimentation, archiving and more. 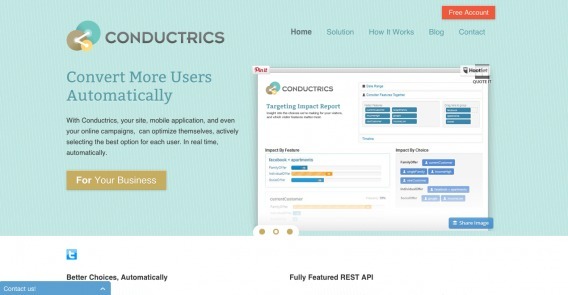 It integrates with testing tools like Optimizely, etc. 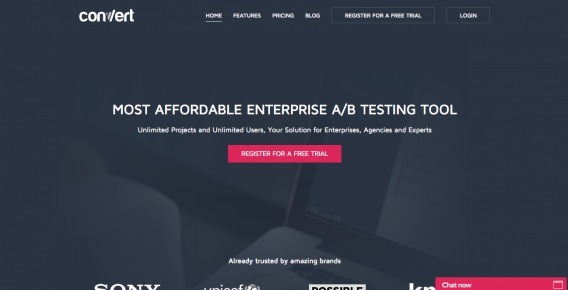 They’re also adding their knowledge from thousands of A/B tests to help growth hackers and optimizers building stronger experiments with higher uplifts. For example, Iridion will contain a library of 200+ psychological behavior patterns and will include qualitative methods to improve text concepts even before you test them. Right now it’s in beta. Kampyle has a whole suite of on-page polling tools – Includes form builder, Dynamic profiling and segmentation, auto-routing and integrations with most major softwares. Their forms are pretty standard, and include things like General Feedback, NPS, and Task Completion. They’ve also got some nice charts to visualize data. Not as much freedom as something like Qualaroo gives you, but its simplicity is great. It took a while to get the hang of it. Honestly, the usability could use a bit of work as simple things like saving the design and deleting items wasn’t very intuitive. After a while though, was pretty fun and easy to use. 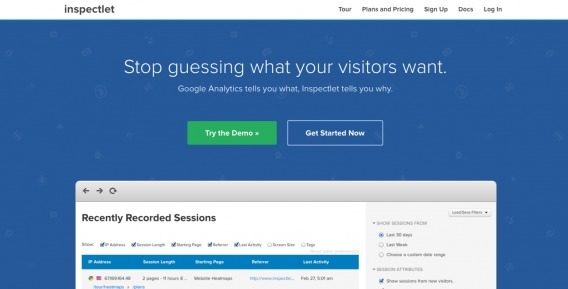 Google Analytics tells you what happened, KISSmetrics tells you who did it. 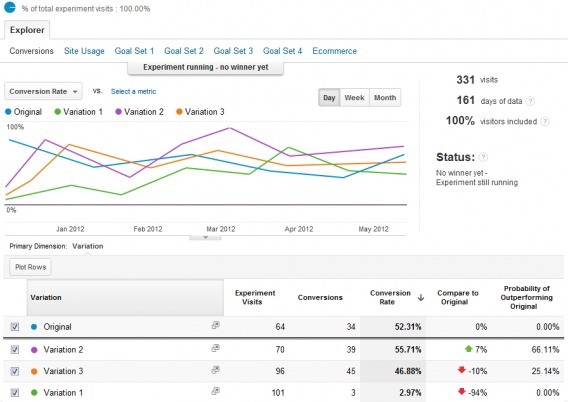 KISSMetrics is excellent for tracking funnels and cohorts. 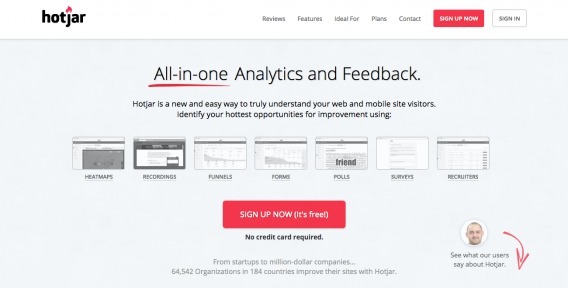 They also have an A/B test report that is a great complement to your testing tool’s analysis. Great data model. Proper visitor stitching which is retroactively applied to reports (yup, they’re reprocessed) makes KissMetrics an excellent choice for SaaS businesses considering an analytics tool. KissMetrics is a winner when it comes to their Funnel Report, especially because they measure users properly. Almost all reports are custom configured; the interface is relatively powerful and quite flexible. 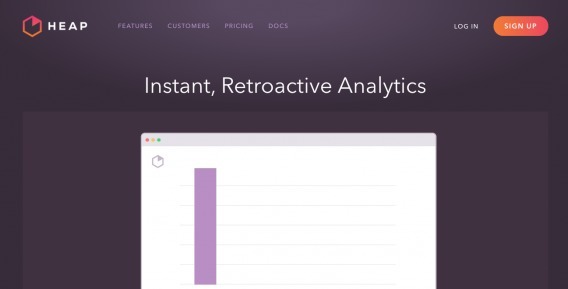 Yes, KM will retroactively crunch your data to create reports. KissMetrics is quite good with cohort reporting. The product seems reasonably priced and they provide direct support. Data is always unsampled in every report. Lucky Orange offers an “All-in-One Conversion Optimization Suite,” including analytics, recordings, live chat, heatmaps, funnel analysis, form analytics, and polls. 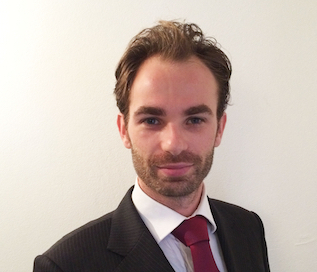 Marketizator is another new player in the testing tool market. They position themselves as a sort of all in one optimization tool: pop-ups, on-page surveys, A/B testing, personalization, segmentation. They’re pretty cheap for all they offer too, even offering a free version for under 10k visitors a month. Overall, Marketizator captures where the market is going, but still uses A/B testing as a backbone to validate results gathered by it’s other components. I think the user interface could use some tweaking, maybe work on a more logical flow for finding what you need. 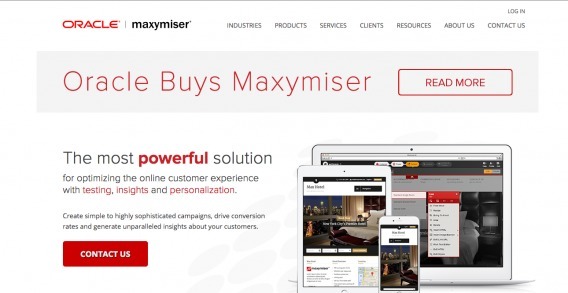 Maxymiser is a powerful tool, one of the more expensive enterprise tools out there. Offers lots of different solutions. Lots of flexibility, and with a focus on personalization as well. Almost across the board, reviews say that they have great service and support, and people tend to like their UI. One big con is, of course, that Maxymiser is expensive and therefore not as available smaller organizations. Mixpanel is one of the most popular tools for funnel analysis and user behavior analysis. It can tell you pretty much *anything*, but you have to configure it yourself. 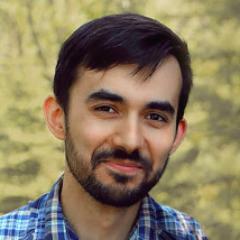 “We use Mixpanel for funnel tracking and mobile analytics. The great thing about it is that it’s super easy to setup, and super easy to gain high-level insights. I also love the ability to trigger push notifications, SMS and emails. They also make it easy to get data out, though it is a bit tricky. There are a couple downsides, however. For one, we’ve encountered some bugs on iOS9, but the support team has been very helpful. Additionally, it doesn’t offer the ability to segment your user base based on events, only properties. For example, if you want to see if people who watched your explainer video convert better, you can’t do that so easily as you can with other tools. Mouseflow offers a whole suite of mouse tracking tools – Click maps, heat maps, scroll maps, recorded user sessions – you name it. 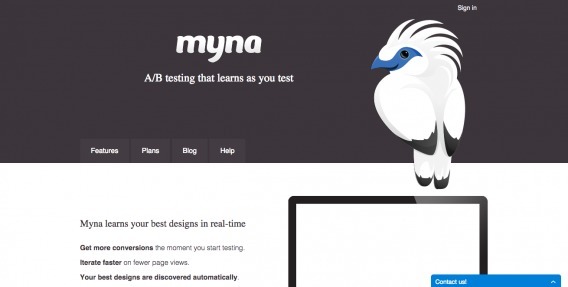 Instead of running simple split tests, Myna operates using bandit algorithms. This means that they do the whole explore/exploit thing differently. 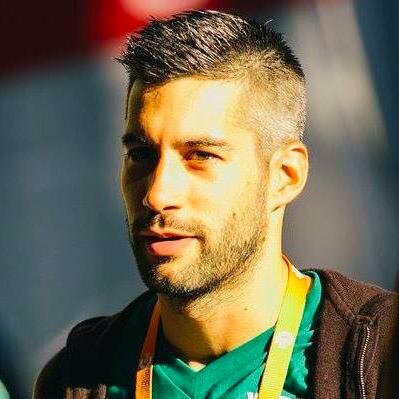 Instead of an independent exploration period (A/B test, 50/50 split) and then an independent exploitation period (implementing the winner), they adjust tests in real-time, showing winning designs more often. That’s a simplification of course. If you’d like to read more about bandit algorithms, read our article on the subject. 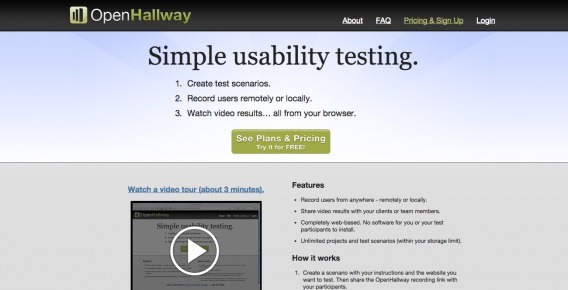 Open Hallway allows you to record users either remotely or locally, and watch the video results from your browser. A great way to identify usability fixes. 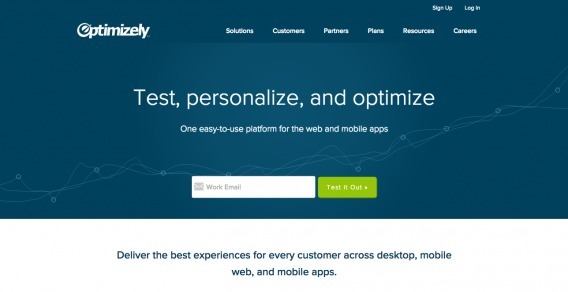 Optimizely is the leading A/B test tool, by a pretty large margin. They’re easy to use, you don’t need to be technical to get small tests running, and their new Stats Engine makes it harder for noobs to mess up tests. Performance and delivery – We switched to Optimizely back in 2012 because of their focus on performance. You can’t have a test that excessively slows down the load time, or a platform that doesn’t track accurately. 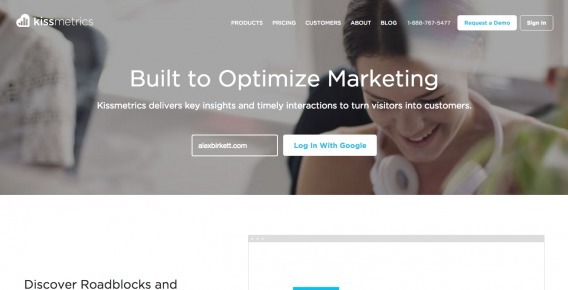 Stats Engine – Optimizely led the way when they launched stats engine earlier this year. They’ve helped the industry move on from traditional – and often badly-applied – statistical analysis. It’s been great to see other platforms following their lead. Integrations – It might not be a feature they shout about too often, but their tech partnerships are awesome: https://www.optimizely.com/partners/technology/ Being able to pull data into tools ClickTale and Mixpanel can make a big difference to sophisticated testing programs. Developer support – Our development team love Optimizely’s large documentation library, which makes it easy for new developers to get up-to-speed quickly. Tests are also simple to set up – especially compared to many of the other enterprise platforms. Stats Engine – Their stats engine is both a pro and a con for us. We like the emphasis on better statistical analysis, but the “black box” of stats engine can be frustrating at times. It can be hard to predict, so sometimes we rely on traditional (and properly-applied) statistical analysis instead. PageSense from Zoho offers several optimization tools under one roof to help you with your website conversions. 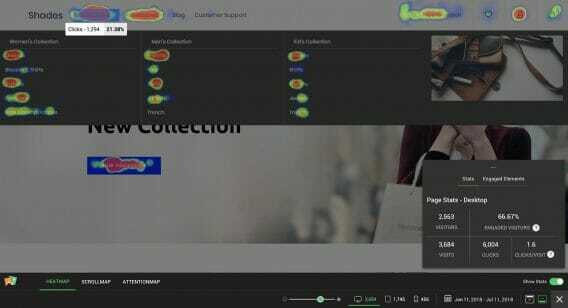 PageSense primary offerings include Goal tracking and Funnel Analysis to track your key website metrics; Heatmap, Form Analytics, and Session Recording to analyze visitor behavior; A/B Testing and Split URL Testing to optimize your conversions. 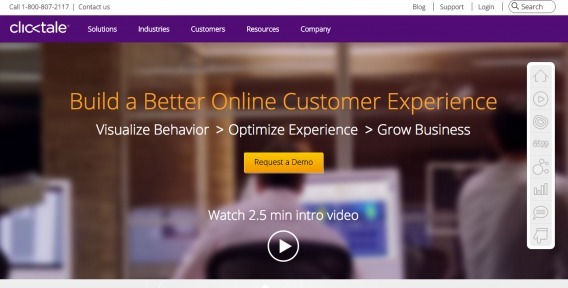 This makes the product’s approach to the CRO process a comprehensive one. Also, all its features come with a segmentation facility for filtering reports, which is a quality addition to this bang-for-buck CRO software. This is a new tool, so we need to hear feedback from more users, however, at the time of writing we were very impressed with the customer experience toolset behind Pagesense. Specifically, we were impressed by the ability for the heatmapping tool to capture data behind interactive elements like hover-enabled mega menus. With Pingdom Website Speed Test, you can test the load time of that page, analyze it and find bottlenecks. 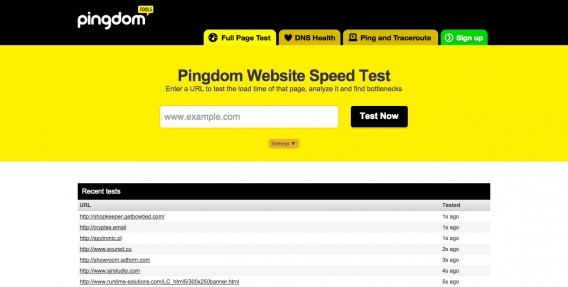 Pingdom Website Speed Test is one of many tools that Pingdom produces. 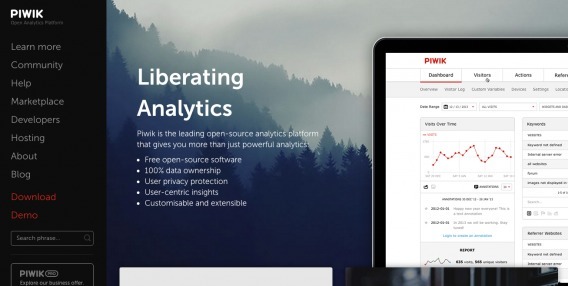 Piwik is the open source alternative to Google Analytics. 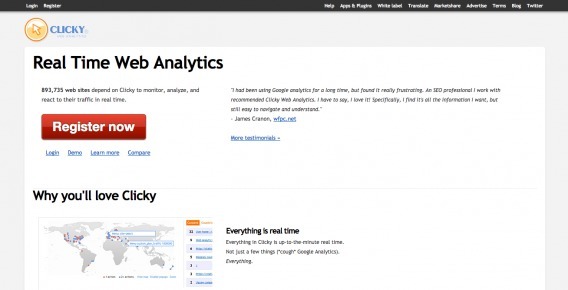 Piwik is sometimes referred to as the Open Source alternative to Google Analytics. The software license is free and you own the data (the software easy to set up and runs on your own server). This is particularly important for companies or organizations where data privacy and ownership is of great concern. From a feature set perspective, the Piwik team basically copies what GA is doing (event tracking, custom variables, ecommerce, goals tracking). An important differentiator (and big pro) is that user ID stitching is done retroactively to the user’s first visit. Additionally, Piwik doesn’t have any Terms of Service limitations around Personally Identifiable Information and has a great User Report when you can delve into all the interactions of an individual → something that can be particularly useful in a B2B space in conjunction with a CRM. Lastly, there are no data related limits outside of what your infrastructure can support:, unlimited hit collection, goals, number of websites, data storage, number of users etc. 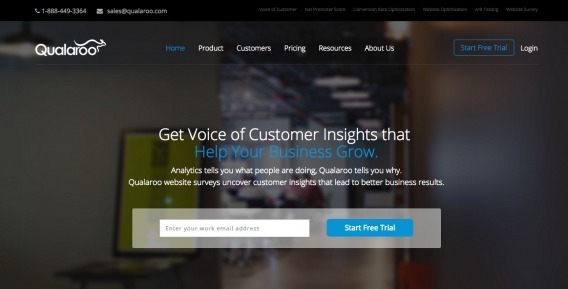 Qualaroo is one of the most popular on-page survey tools. Sean Ellis started it and it’s grown a lot in the last few years. It is great at targeting the right customers at the right time, and it’s easy to setup. 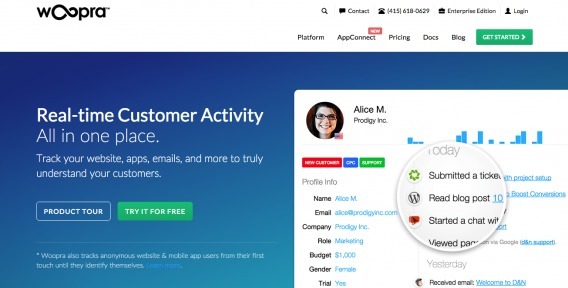 Also integrates with common tools like Optimizely, Marketo, etc. They’re onboarding is great. Nothing was confusing at all, unlike their competitors. The walkthrough made everything clear. 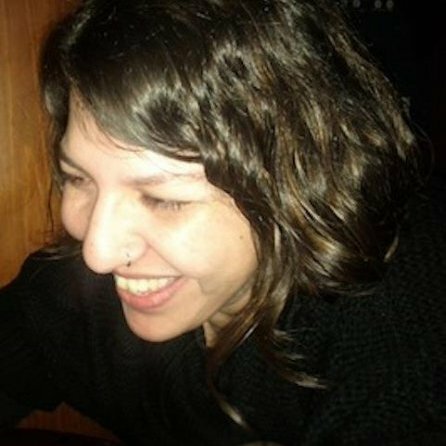 “Overall it’s the best research tool in the market for quick, low-cost qualitative research. Many times you can uncover insights quickly and cheaply with Qualaroo surveys rather than doing in depth customer interviews. Pre-made templates: Comes with pre-made surveys for qualitative research. For example, “What’s the one thing that almost stopped you from buying from us?” These make it extremely fast and easy to get started. Regular Updates: You’ll get notified each time you get a new response, as well as a summary of responses for that week. This makes staying on track of qualitative research easy. Low Response Rate: Expect 1-3% of visitors will complete a survey. To get 10-20 responses, you’re going to need to work on sites doing at least 100-200 conversions/mo, or put surveys higher up funnel if customers aren’t there yet. 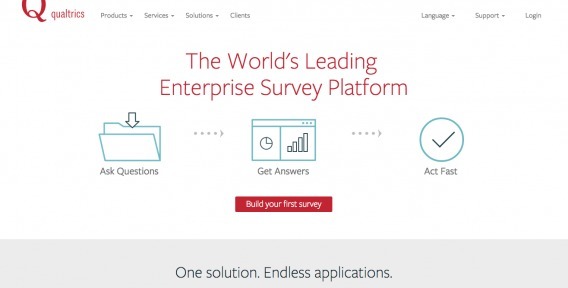 Qualtrics is a powerful survey tool and very common for enterprises (and universities). The data collection and analysis is unmatched for large data sets. 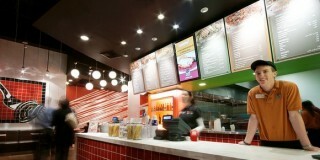 “This Provo-based company has been at the forefront of online survey based research since 2002. ScreenFly, part of a suite of tools by quirktools.com, is a great cross-browser or cross-device tester. You just type in the URL and you can visualize it from every device and browser. It quickly shifts to show you different screen sizes and whatnot. Great usability. The same site also offers free wireframing and sitemaps. Seriously great resource. SessionCam is a popular usability tool that offers a range of capabilities, centering on session playback and mouse tracking. 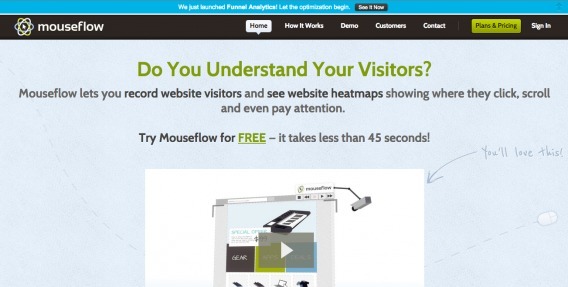 “Some users ignore the Funnels feature, because everyone already has funnel visualisation in GA. The difference is that SessionCam gives you a more granular view of where things go wrong. 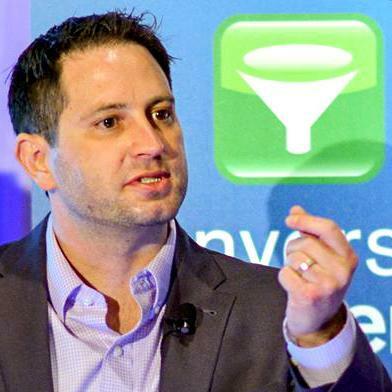 Not only can you easily play back sessions related to a particular stage in the funnel, but it helps you to understand exactly how forms may have contributed to drop off rates. So you start with a holistic view and drill down from there. Like other tools in this category, SessionCam also lets you do heatmaps, scrollmaps and mouse movement maps. My favourite part is that it integrates neatly with GA, UA, Optimizely, VWO and a few other tools. This means you can examine in detail the difference in behaviour between the control and variations in your experiments. 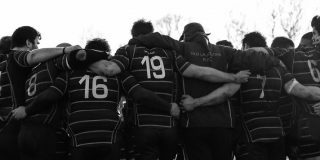 If you treat your split tests primarily as learning opportunities, you’ll also be excited about this. “When you stack different mouse tracking tools we evaluated against each other, the fact that the SessionCam interface is stuck in the past wasn’t a deal breaker. 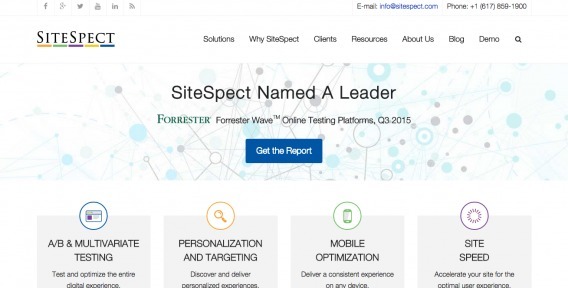 SiteSpect is a testing tool that uses a proxy server, so it avoids many of the client-side problems and retains the robustness of server-side tools. The tool has a wide variety of offerings like site speed optimization, mobile optimization, and personalization. 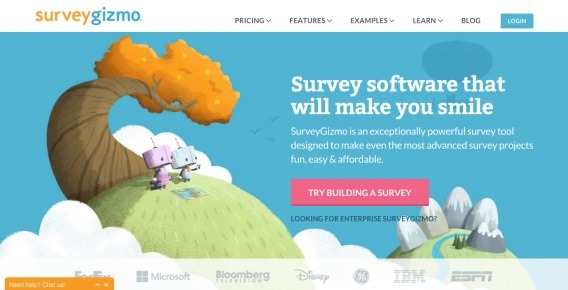 SurveyGizmo offers easy-to-create online surveys. They’re much like the other tools, except they have limited features on the free version. You can get basic stuff done, and the UI is great. If you’re looking for advanced customization, you’ll have to pay. 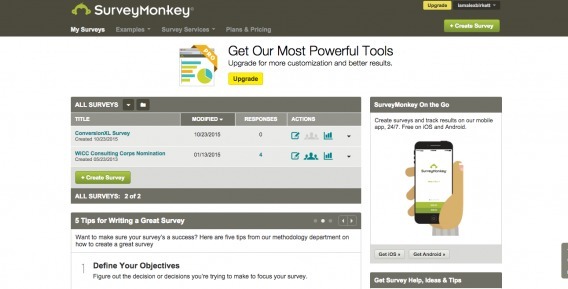 Survey Monkey is one of the most commonly used tools for creating and distributing surveys. It’s really easy to set up surveys, equally effortless to analyze the data. I’ve also used this tool in the past for easy form submissions, such as nominating people for awards or taking surveys for research projects. I’ve never had any complaints about it, but it’s never blown me away either. Just got the job done. 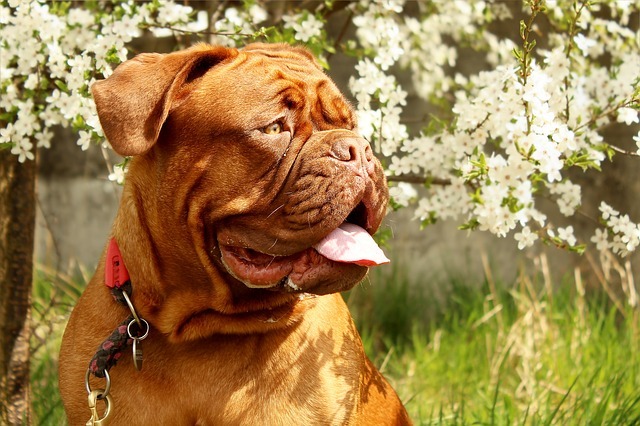 “This is the idea of research made easy: come up with a few questions, determine a sample size and Survey Monkey provides a conducted survey (from their own sample base) and subsequent analysis. Seems simple but SM does not pretest or validate customer questions. They will produce a survey with price depending on numbers of questions and respondents. Problem is this type of approach allows customers with extremely limited experience to produce something that may look like a valid survey. TryMyUI lets you can have as many people as you want to be part of a usability test (when you recruit your own testers). 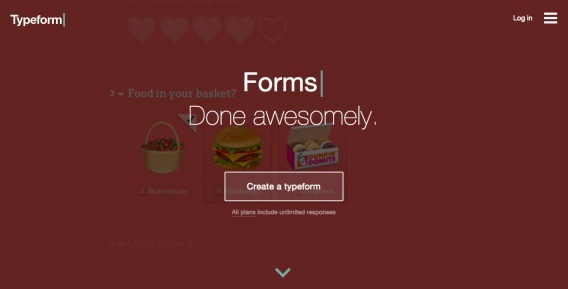 TypeForm surveys are awesome and beautiful. Definitely the best UX of any of the survey tools on this list. It’s also really easy to drag and drop questions and design your survey. Overall, great experience. UsabilityHub.com offers a suite of popular usability tools. “UsabilityHub.com has an awesome suite of UX tools. I use these for Conversion Research and especially for pre-qualifying hypotheses before I decide whether to test them in the wild. You can recruit your own panel for a private test via email invites, or you can use Usabilityhub’s own panel either randomly selected or based on demographics. Users see a screenshot (e.g. Home Page Hero Area) for 5 seconds and then have to answer questions afterwards. This is a fantastic way to understand how users intuitively react to a specific page or piece of content. 1. What do you think the page was about 2. What do you think the company sells. The insight you get is fascinating and can help you identify fundamental problems that could be hurting your conversions. With a click test you upload a screenshot or a wireframe and ask people to click on e.g. a page element. Example of use: I was doing research for a new pricing grid and ran a number of tests experimenting with how different visual cues affect behavior. I uploaded the grid wireframe and asked users to click on the plan that seemed to provide best value. “Analytics tell you where people leave your website, UsabilityTools tells you why. UserTesting.com is probably the biggest marketplace to find testers. “Way back in the dinosaur age (pre 2010) I used to run real, live, in-person usability studies. This meant sourcing a panel of customers–usually off a shady craigslist post!–bringing them into your office, and having them walk through your web experience. When (or if!) it worked, you could do screen and audio recording of your session, but that wasn’t always reliable so you had to assign someone to take notes. By hand. For a startup, it was a terrible process, but the best we could do. UserTesting has done away with all of that nonsense, and is an awesome way to get real user feedback from remote testers on your web experience. 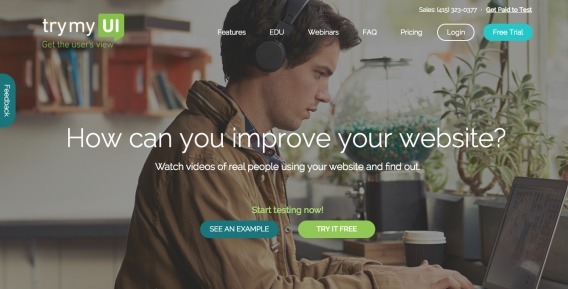 You just plug in your site, a couple tasks you want a user to try to accomplish, and get great high quality videos of users testing your site in less than a day. It’s a great way to overcome your internal blindness or bias about what is and is not working on your site, and has provided great insights for every experience I’ve worked on. No shady craigslist postings and managing schedules, etc. 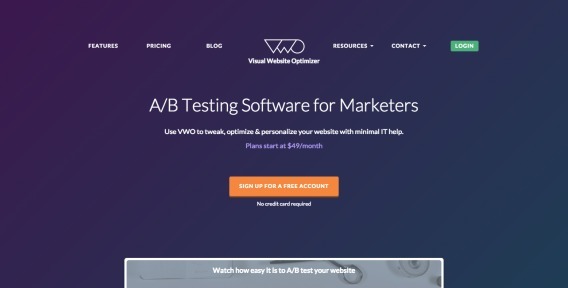 VWO is a powerful, popular, and easy-to-use A/B testing tool. Their ‘What You See Is What You Get’ (WYSIWYG) editor makes it incredibly easy for marketers to set up tests without the help of dev. VWO also launched a new stats engine based on Bayesian decisions called Smart Stats. It is supposed to make it easier to make business decisions and not to mess up tests. VWO is pretty all-inclusive. It also offers heatmaps and clickmaps, as well as personalization tools and their newest feature, on-page surveys. 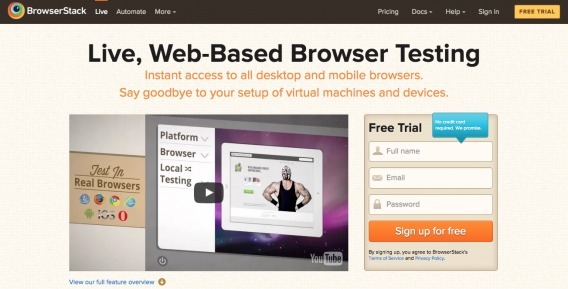 “VWO is an excellent conversion testing platform. One of the main pros is the visual interface. In my opinion, I think the UX is more user friendly and the reports are more visually appealing. The reports and charts are easier to analyze than other testing platforms. Another good thing about VWO, is that is very easy for anyone to walk through creating a new test. It is a simple step by step process that I think makes more sense, especially to someone who is new to A/B testing. Previously I would would have recommended another A/B testing tools if you were a developer, but VWO recently improved their code editor which in the past was really buggy and caused more headaches than needed. 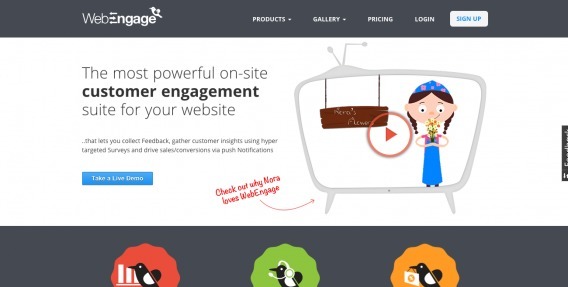 Webengage is pretty neat because it includes notifications (like discount popups), as well as surveys and the like. Their free plan actually goes decently far if you’re a startup or smaller organization. Not as customizable as some other triggered popups and surveys, but the simplicity is alright depending on your purposes. 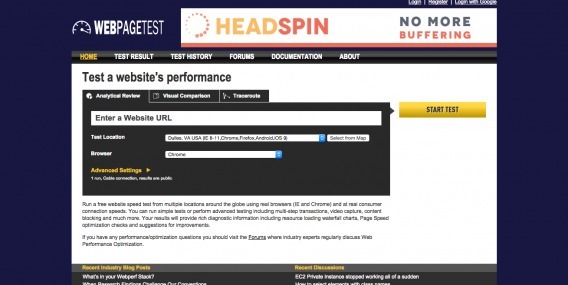 WebPageTest can run site speed tests from a variety of locations. By far the most in-depth free tool. Has charts of content breakdown, first view, repeat view, etc. Pretty neat, but not as easy to read as the Google one. 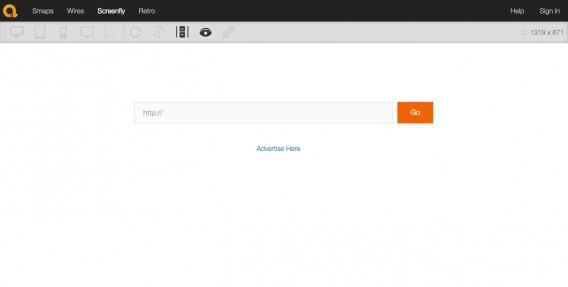 Woopra is a real-time digital analytics tool that is easy to set up and start running. It also offers some cool features, like real time customer analytics, customer funnel analytics, event tracking, cohort analysis. Basically, it tracks users across digital touchpoints (website, mobile app, help desk, marketing automation, etc.) and builds a comprehensive behavioral profile for each user. This makes it really helpful for startups. Woopra also tracks anonymous website & mobile app users from their first touch until they identify themselves. A con is that its integration with other tools is limited, especially when compared to universal tools like GA.
Yahoo! 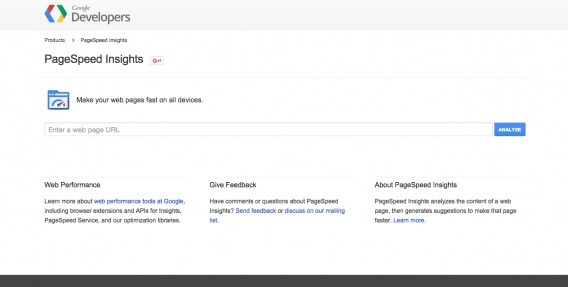 YSlow, like Google Pagespeed Insights, gives you a quick and clear picture of your website load speed. Their algorithms differ a little, but YSlow is effective nonetheless. Try looking at both and tackle the common problems. There an other tool to mesure performance and quality: https://www.dareboost.com. The best tool I used. Easy to read and very complete! Many thanks for featuring us (changeagain.me) in your post. Such an honour! you can try TruConversion (beta mode) – heatmaps, session recordings, surveys, form analytics etc. Thanks for featuring Formisimo, love the review. Thanks for the comment, glad you liked our list! Great summary! For VWO, did you know that there is an integrated On-Page Survey function (that Peep has already tried out), and of course our Heatmaps, which have been bundled with VWO since the beginning? Awesome – added a link for the On-Page Survey function. Thanks! Thanks Arthur – updated it! I stand corrected! I would suggest calling your intervals “credible intervals” rather than “confidence intervals”. I believe the latter is a Frequentist term. Am I missing something? What link do I click to see the list? 53? Really? Respectfully, I stopped before I even started. If you can’t make up your mind, I certainly can’t. I look to ConversionXL to reduce the clutter in my brain. Filter by the tool category or my favs – and you have a much smaller list. I went through every single one and could’ve went through another 53 this was great! Great article Peep and Alex, always fun to see what you guys are using. Good eye – these custom fields can be quite sensitive to things like upper and lower case. Updated it! Thanks Alex for a great post, but, without screenshots of each tool I don’t think it grabs you to either check the most relevant ones to your business or bookmark it as a source of needed links. I would just outsource this. I’m sure it would be well worth it! Thank you – that’s an awesome idea. This will be a post that we continue to adapt and update, so that’s something I’ll look into. Could bring a clearer picture to each tool. One of the pioneers of AB/MVT (Optimost, now part of HP) isn’t listed. Anyway, great info., thanks for the write up. Hey Jake! Indeed we didn’t list all the tool. Have you used it recently, and want to write a review about it? Metric: number of websites adopting it as their optimization platform. You should try Yandex Metrika it has basically all of these 53 tools in ONE place. It also records what exactly the users are doing on your website. Kinda creepy but works so well! 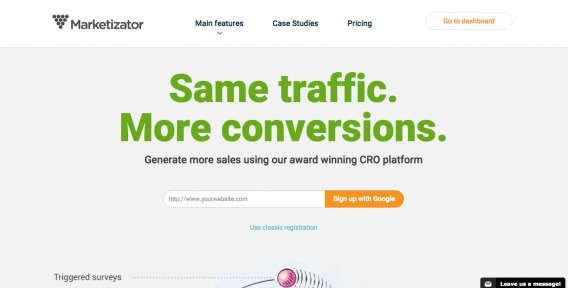 This is a great list of tools information post to improve our conversions, I am using some of them, but I don’t know some of the tools names till now, after reading this article I came to know about them, thanks for sharing such valuable information, see you soon with another article. Glad you enjoyed the post, Siddaiah. Thanks for the comment. 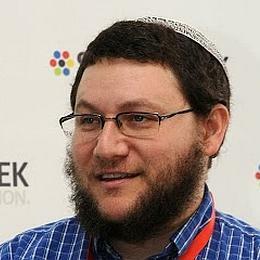 On behalf of ClickTale, thanks so much for the article and thanks so much to Yehoshua for your kind words about ClickTale! Wanted to add that one way to analyze by marketing campaigns is to integrate with Adobe and Google where you may already have these campaigns configured. ClickTale provides a two-way integration with Adobe and Google Analytics such that any segments defined in those solutions become available within ClickTale. All analysis (funnels, heatmaps, replayc, etc.) can then be filtered by your Adobe/Google segments. Our customers like that because it avoids the risk and redundancy of configuring segments in multiple locations. They usually think of Adobe or Google as the heart of their digital analytics eco-system and this integration enables them to continue their analysis flow into ClickTale. On behalf of the ClickTale team, in addition to my previous thank-you and comment about integrated analysis I should also mention that filtering analysis by marketing channels, keywords, and other traffic sources are also just some of the many built-in segmentation capabilities. Thanks for the heads up, Akin. We’ve updated it – let me know if everything looks good now! 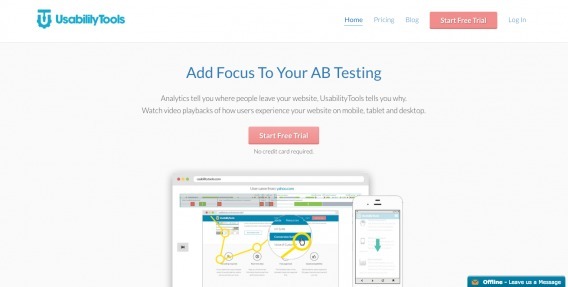 Its sure helpful having this list of 53 top conversion optimization tools. To be frank, some of these tools are new to me. I have only utilized a few such as Google Analytics, and Pingdom Website Speed Test. I am planning on using CrazyEgg and KISSmetrics and I hope they would not disappoint. I see that each of these tools have their different analytical function! Hey Alex – Great list I must say! Always happy to discover new tools! One thing that is quite a must have (from experience) in order to implement/test new tools are apps like Zappier and Segment which allow you to enable those new tools on your sites in a matter of seconds. 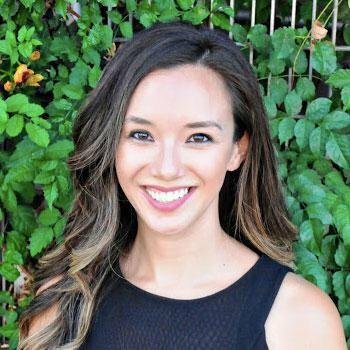 What i felt was missing tough, are applications like http://www.trackingdesk.com that enable building and testing responsive marketing funnels which can increase immediately both onsite and post click conversion rates. Great review and nice to see which tools are used in the industry. Maybe an addition to the list. I’ve used both Pingdom and Google Pagespeed insights but I prefer gtmetrix (gtmetrix.com). Seems to give me more detailed info. 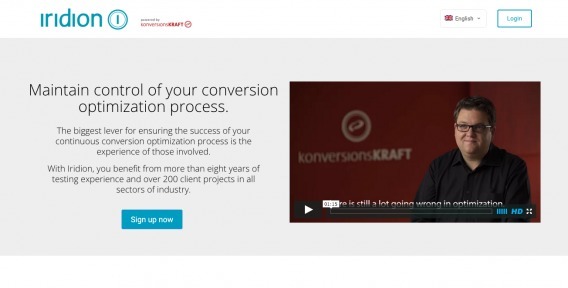 You have a quite long list of tools for conversion optimization tools. Not all are familiar to but yet I like it because this list gives me list of ideas that are useful. Readers would love the tools shared. It might help them use better tools to leverage their goals. Google tools and CrazyEgg are some of the top tools I will recommend. 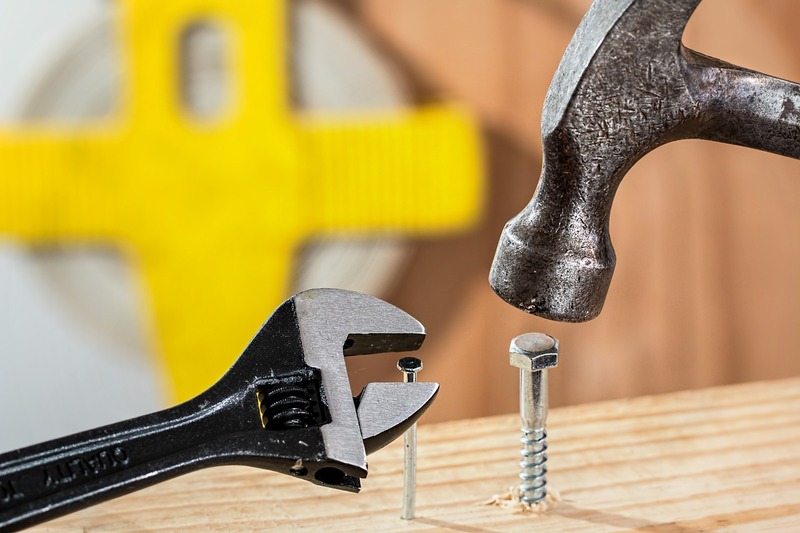 A marketer needs to use the right tool for the right job. No mention of Google Consumer Surveys with the Qualitative Surveys section? That is a must add. Second time I submitted this? Thank you. What’s your view on Monetate or Evergage? It falls in the same class as Maximyser. Both tools are enterprise level and are A/B multivariate and deep personalisation platforms. They are more personalization, and less testing tools. Setting up a test with Monetate is a nightmare. Analyzing test results – horror. Integrating tests with tools like Google Analytics – horror! Evergage provides a way nicer user experience. You can run tests within the personalized segments, but you can’t / shouldn’t really use it as a testing tool. You need Optimizely or VWO etc for that. 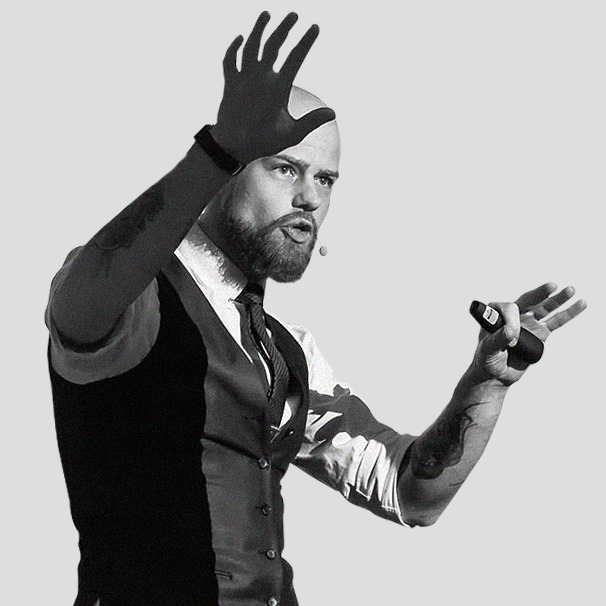 You might want to consider adding Reactful to the mix for in-session Reactions to visitors’ digital body language. Should be pretty relevant for people looking around for powerful conversion tools. Due Note: I’m one of the founders of Reactful. I would highly recommend https://survicate.com/ as one of the best survey tools that I have used. Their targeting and segmenting capabilities were the best ones I have seen so far. Next Article What’s The One Thing That Creates High User Engagement?